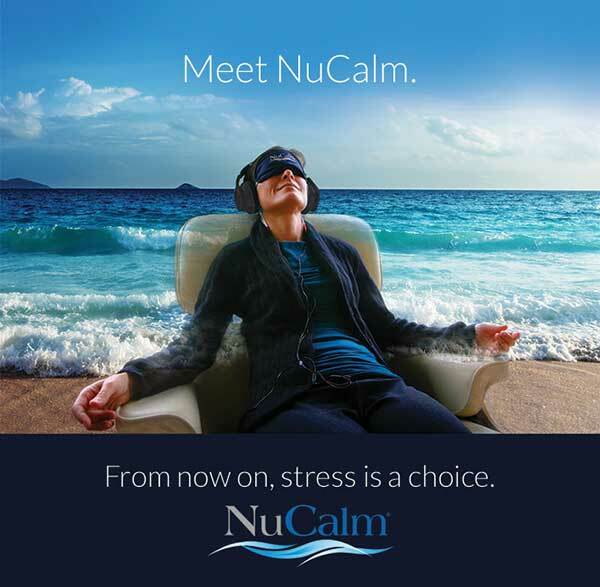 NuCalm is a patented system that naturally relaxes the mind and body within minutes, providing a comfortable clinical experience for patients. Since dental anxiety is a huge issue for some patients, Indiana dentist Dr. David Smith was looking for a way to help patients relax during treatment. After incorporating NuCalm into his practice, Dr. Smith reported that the system was “incredibly effective” at calming dental anxiety. “In a few short minutes, the patient is stress-free and able to be relaxed during treatment,” he reported, adding that this helps create a positive experience for both the patient and the dental team. NuCalm is a patented system that rapidly creates a deeply relaxed state without drugs and maintains it for the entire procedure. The system mimics the way the body naturally winds down and prepares for sleep—a process that reduces anxiety—and that relaxed state decreases the involuntary motor responses that can interfere with dental treatment. Using 4 components that interrupt the adrenaline response and guide the mind and body to a relaxed state, NuCalm is easy to implement into a practice. The 4-step process consists of a topical cream or dietary supplements; microcurrent stimulation applied with a neuropatch behind each ear; the NuCalm app and headphones; and a light-blocking eye mask or glasses. “NuCalm is a very predictable technology that allows the dentist to do procedures very easily without patient anxiety or stress,” shared Dr. Allan Winchar, who said the system is easy to use and “creates a positive experience for the patient.” After seeing the science behind the NuCalm system, Dr. Kevin Winters said it fits dentistry’s needs perfectly and he won’t practice without it. Calling it the “best thing to happen in dentistry,” Dr. Ryan Coulon said NuCalm works perfectly as an alternative to forms of sedation and his “patients couldn’t love it more.” Dr. Frederick Abeles said the ease of administering NuCalm was one of his favorite features and called it a 10 on a scale of 1 to 10. NuCalm is unique because it creates deep relaxation without using drugs, causes no side effects, and requires no recovery time or supervision, according to Solace Lifesciences. By naturally creating a relaxation response in patients, NuCalm enables clinicians to safely control the most complex, unpredictable, and unreliable part of clinical treatment—the patient. 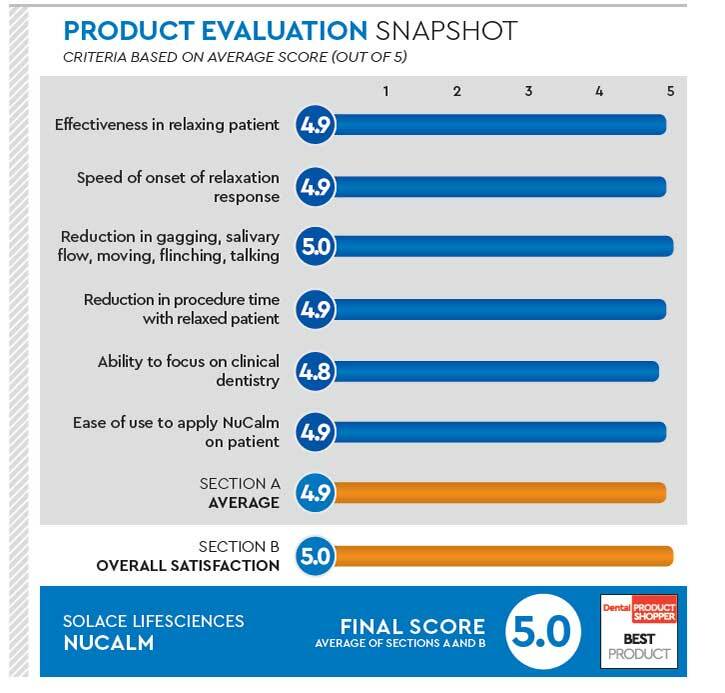 NuCalm benefits the dental practice as a whole by reducing procedure times, improving clinical results, and satisfying patients, which ultimately helps recruit new patients. Because patients are more relaxed with NuCalm, they move around less, which allows the dentist to perform procedures more quickly. “Dentistry is much easier when we can focus on the procedure and not worry about a squirming, complaining, salivating, nervous, uncomfortable patient,” noted Dr. Sandra Eleczko. Dr. Imm said he estimates that his practice’s efficiency increased by 30% when using NuCalm, and that has brought more referrals and greater profits. Dr. Winchar called NuCalm “an excellent practice builder when patients tell their friends about positive experiences,” and Dr. Coulon said it fits his practice philosophy and has brought in many new patients via word of mouth.